Raja typically means king of a kingdom. But in a more cosmic sense, Raja is the organizing power of the structure of existence. Raja Maathungi is the Goddess who presides over that. 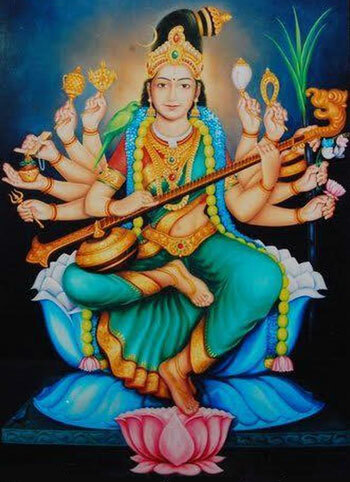 Raja Maathungi is similar to Saraswathi, the Goddess of intelligence. Intelligence means structure. It’s beautiful that pure Consciousness becomes conscious of itself, perceives itself as other, and two things are born. Consciousness becomes, aware of those two things, a third thing and it cascades out in this crystalline structure. One becomes two, three, a fourth, a fifth…. It’s that very structure interacting with itself. It’s lively; it’s not like you build a crystal and it just sits there; it’s dynamic. Consciousness isn’t static; it’s superfluid. So, it’s the liveliness of that structure which is intelligence itself. I think that’s just beautiful. So Raja Maathungi is that. I guess that’s why royalty wear crowns and gemstones! Raja Maathungi is the crowning gemstone of pure Consciousness, which upholds and is the reference point for the intelligence that permeates and upholds the universe, and is the governing principle of the universe. So, by aligning with Raja Maathungi, we align with the governing principles that uphold all of life. If we align with that, it upholds our lives, in a very beautiful way.